After a day-long, nearly 500-mile long drive from the New England Aquarium’s sea turtle hospital in Quincy, Mass., to Maryland’s Eastern Shore, three endangered sea turtles that had been rescued on Cape Cod for a variety of reasons were released into the warm surf of Ocean City, Maryland. These sea turtles received a significant head start on their usual autumn migration southward as ocean temperatures off of Cape Cod are a bracing 58 degrees while the mid-Atlantic waters are a sea turtle friendly 71 degrees. 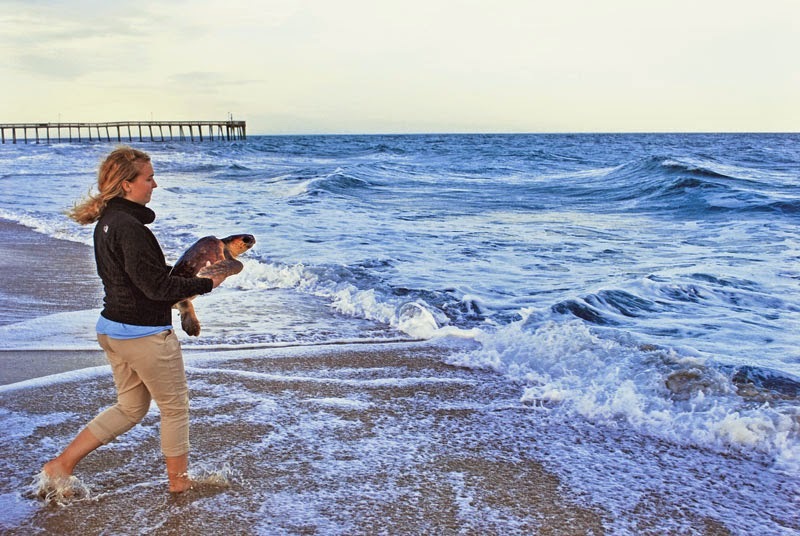 A loggerhead sea turtle rehabilitated by Boston ‘s New England Aquarium is released by National Aquarium intern, Melissa Bittner, off of Ocean City, MD, Tuesday. The 30 pound sea turtle had been rescued from a fishing net off of Cape Cod in September, was treated at the New England Aquarium’s sea turtle hospital in Quincy, MA and then driven nearly 500 miles south to the much warmer and more sea turtle friendly waters of Maryland. The three turtles included a 30 pound loggerhead sea turtle that had been recovered from a gill net near the elbow of Cape Cod in Chatham in September. Two smaller Kemp’s ridley sea turtles, the world’s most endangered sea turtle species, were also released. That included the smallest turtle in the group that had stranded this past September 10 in Brewster MA, an area with tricky tides. Summer time sea turtle strandings usually are associated with underlying medical issues, but to the surprise of the New England Aquarium rescue biologists and veterinarians, this young turtle was fine and probably stranded due to inexperience with large tides and strong local currents. The last Kemp’s ridley, a 12-pounder named Golden Crisp, had been in rehab for nearly 11 months. It had stranded last November in Wellfleet, Mass., during the annual late autumn sea turtle stranding event on Cape Cod due to hypothermia for those turtles that have failed to migrate. After recovering from the cold stunning, Golden Crisp was slow to recover from some persistent lung and blood infections. It was the last sea turtle from the 2013 cold stunning season in the New England Aquarium’s suburban Boston rescue facility. More than 80 other endangered and sea turtles from last year’s hypothermia event have either been released or transferred to other turtle rehab facilities. That gives the Aquarium’s marine animal rescue team about a month to rest and to get prepared for the start of the 2014 sea turtle stranding season on Cape Cod in early November. Right Whales in the News!